Union City, Ga – Shoppers and associates at Publix stores in metro Atlanta’s southern crescent generously donated $30,219.59 to Christian City Children’s Village during the annual “Food For All” campaign in October and November 2018. “Give Hope” themed boards were displayed at register areas, where Publix customers and associates supported the campaign with $1, $3, or $5 donations. 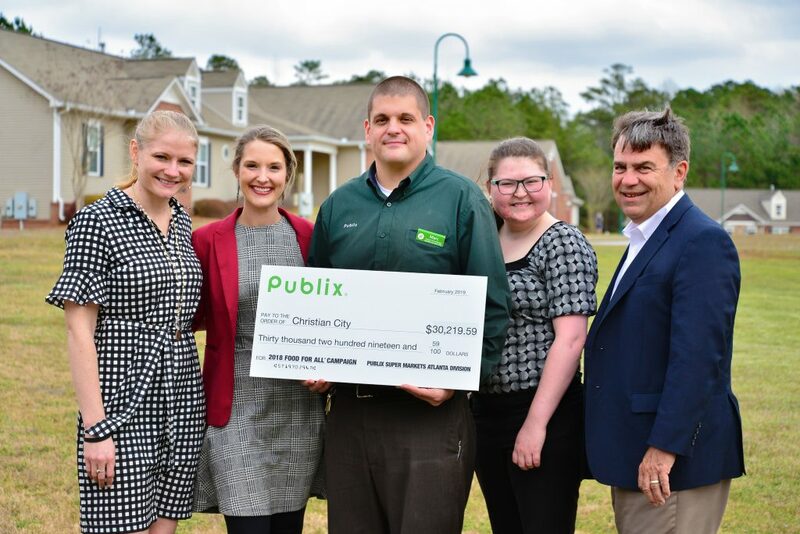 Marc Pater, Customer Service Manager, and Lauren Ledbetter, Assistant Customer Service Manager, at Publix-Tyrone presented the donation check at Christian City Children’s Village in March 2019. George Martin, Executive Vice President of Christian City, thanked Publix Super Markets for making a difference in the lives of children in metro Atlanta’s southern crescent. “We are grateful to the many individuals, churches, businesses, civic groups and foundations who support our ministries and help us care for abused and abandoned children. The Publix Food For All campaign is a wonderful example of a community coming together to provide for children in need,” Martin said. Christian City, located in Union City, between Fairburn and Fayetteville, cares for children of abuse and abandonment through its Children’s Village Residential Program, Safe Place Runaway & Homeless Youth Program, Crossroads Foster Care & Adoption Program, and Thrive Graduate Transition Program. Christian City was established 54 years ago when the first cottage for abused and abandoned children opened on Valentine’s Day, 1965. Today, there are more than 1,000 residents, both children and older adults, living at Christian City in south metro Atlanta. In addition to the four Children & Family Programs, the campus includes retirement homes and apartments for active seniors, a 200-bed skilled nursing and rehabilitation center, a 150-bed assisted living center, and two memory care units. For more information or to learn how you can help, call 770-703-2636 or visit christiancity.org. Publix is privately owned and operated by its more than 200,000 employees, with 2017 sales of $34.6 billion. Currently Publix has 1,213 stores in Florida, Georgia, Alabama, Tennessee, South Carolina, North Carolina and Virginia. The company has been named one of Fortune’s “100 Best Companies to Work for in America” for 21 consecutive years. In addition, Publix’s dedication to superior quality and customer service is recognized among the top in the grocery business. For more information, visit the company’s website, corporate.publix.com. PHOTO (by Larry Regier): On behalf of Publix shoppers and the 2018 “Food For All” campaign, Marc Pater, customer service manager of Publix-Tyrone, and Lauren Ledbetter, assistant customer service manager, presented a check for $30,219.59 to Christian City Children’s Village. Pictured at the Children’s Village are (from left) Sarah Booth and Michaela Guthrie, Program Executives of Christian City Children & Family Programs, Marc Pater and Lauren Ledbetter with Publix-Tyrone, and George Martin, Executive Vice President of Christian City.